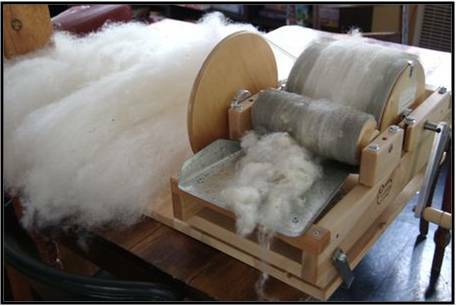 Carding is best for short to medium length fibers and is specifically called for in prepping fiber for “woolen” spinning. Carders separate and align fibers, but do not screen out second cuts or VM. Remove veg and second cuts, dry tips, etc. 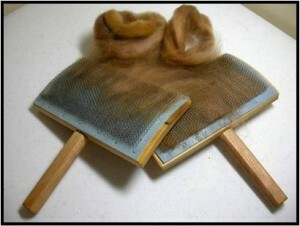 Also good for cleaning drum carder! Make rolags to spin woollen-style! Use hand card as burnishing tool for drum carder. Many styles available, hand turned or motorized. Very important to have adjusted properly for transfer of fiber between drum and ease of turning. Drums should be about an index card thickness apart. Try to keep fiber out of axles. Can use hand card as burnishing tool, to smooth batt.